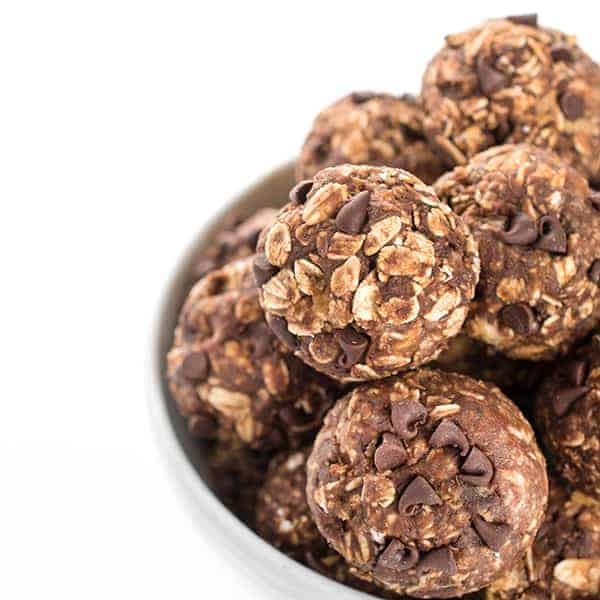 Sweet and satisfying, these energy balls are filled with chocolate, cherries and walnuts to give you a quick energy boost on-the-go. My 2 year old little man loves to eat without assistance but let’s be real, toddlers aren’t exactly tidy in the kitchen. While I’m certainly not a neat freak by any means, I try to have plenty of healthy, ready-to-eat finger foods on hand at all times. Unfortunately for my husband, those are rarely found in a bright orange box. While I’ve made energy balls several times before, this particular recipe was inspired by my beautiful friend Ali. Of course, Michigan girl in me couldn’t pass up an opportunity to incorporate dried cherries, one of my favorite fruits of all time. Tart, sweet and packed with antioxidants, I love pairing them with chocolate. For added protein and heart-healthy omega-3 fats, I added natural peanut butter, crunchy walnuts and flax seed meal. Clearly I can’t pass up any chance to eat more peanut butter. These energy balls keep well and are great to stash in your purse, diaper bag, glove compartment or gym bag. We love eating them chilled but they are equally delicious room temperature. In a medium ball, whisk together peanut butter, honey, vanilla, cinnamon and salt. Stir in oats, flax seed meal, chocolate chips, walnuts and cherries. Using a small ice cream scoop or two spoons, roll into evenly sized balls and place on a wax paper-lined baking sheet. Chill balls 30 minutes (or longer) to set before serving. Energy balls be stored in an air-tight container in the refrigerator for up to 5 days, perfect for brown bag lunches, picnics or more. If they don't form perfectly right away, keep rolling them between your hands. As you roll them, the warmth of your hands will help release the natural oils in the walnuts which will help shape the balls. Recipe inspired and slightly adapted from Gimme Some Oven. About how big are these? I’m trying to be more mindful of portions, especially with tasty bites like these! They are about 2 tablespoons? I hereby dub you the energy ball queen!! I know I say this about all of your bites, but I love these. Dried cherries are da bomb. hahaha THANK YOU! That’s a huge honor! I looked at that photo and though . . . hmm . . . look like dried Michigan cherries to me! I’ve got some in my pantry, and think that my kids would love snacking on this treat. These look amazing, Liz! Dried cherries and chocolate are so perfect together, and the addition of walnuts really takes these little beauties over the top! Addicted to energy balls!! Love the cherry/walnut combo! It’s one of my favorites and of course the chocolate just takes it to the next level. These look delicious! 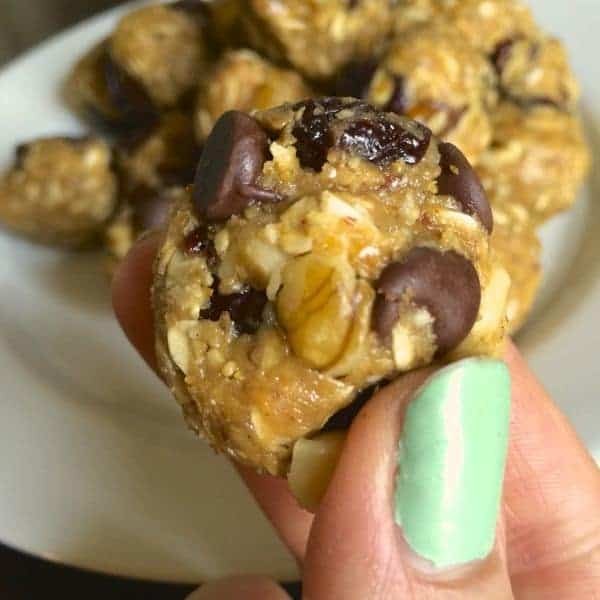 I love making protein balls/bars at home. I like knowing what ingredients go in them, and they’re also perfect for a sweet treat. Though I have actually never used dates, so I need to try this soon! I can’t stop making them lately!! 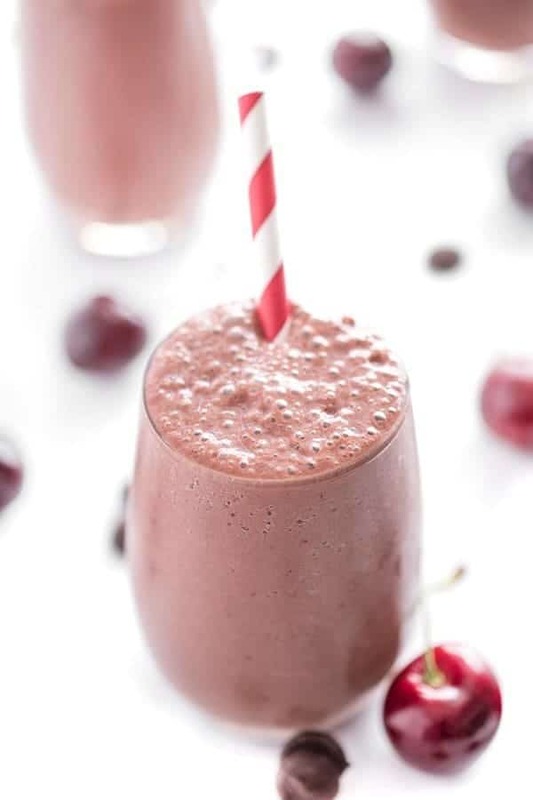 Chocolate and cherries are such a delicious combo! I could munch on these all day! I had to hoard them so I didn’t eat them all at once! These sounds awesome. Does it matter what kind of oats are used (steel cut, whole, etc.) Thanks! There is so much I lovea bout this. But mostly the balls part, right? 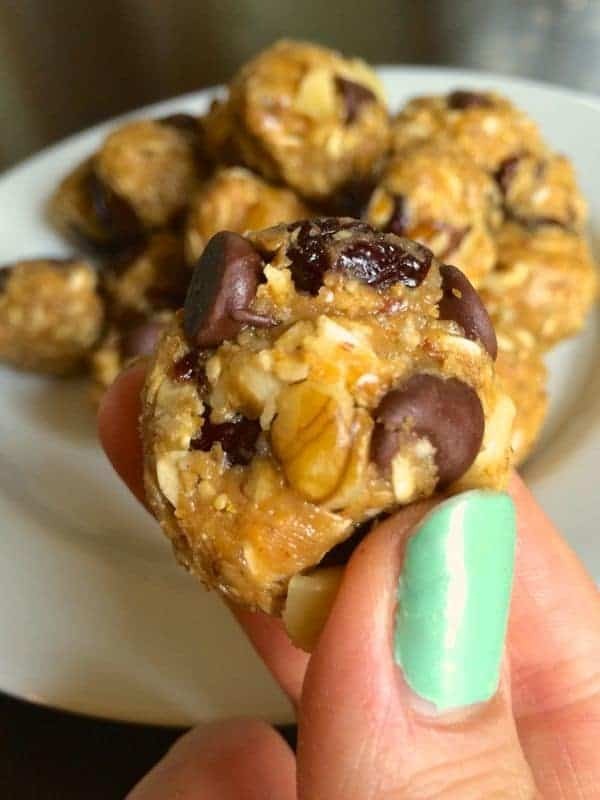 I have been obsessed with making energy balls and bars for my boys too! For the 1 year old, I roll teeny tiny little balls for him to munch on. LOVE polish, girlfriend! And these little balls wouldn’t stand a chance in my house!!! I could definitely munch on these all day long! I love cherries and chocolate! So easy and with my favorite things – making ASAP! I hope you try them and love them Anna! Oh my gosh… great minds think alike! I just pulled out everything on this list to make the same thing, except I used pistachios instead of walnuts. Great snack! Love that you used pistachios!!! Liz – these look absolutely delicious!!! 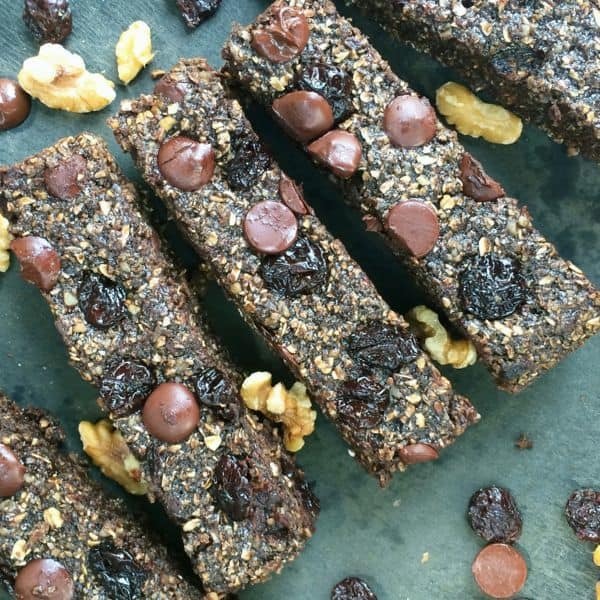 I need these in my life ASAP – chocolate, cherries, nuts AND energy – perfect!!! haha the perfect combo right?! These look fantastic! I can always use a mid-morning and mid-afternoon pick me up and these would be just the ticket. Yes exactly!! I hope you enjoy!